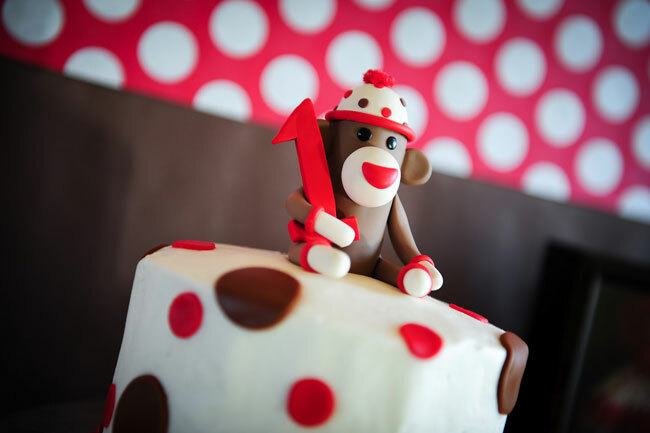 Sock monkey party: Jameson is 1! 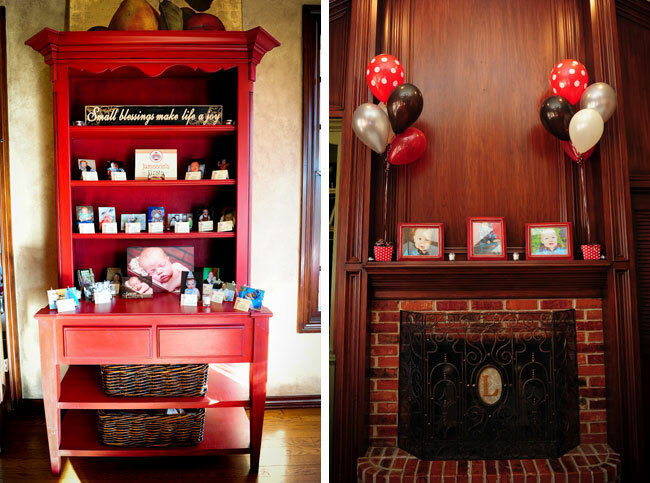 When it comes to a first birthday party, it doesn’t get more sentimental – or grand! 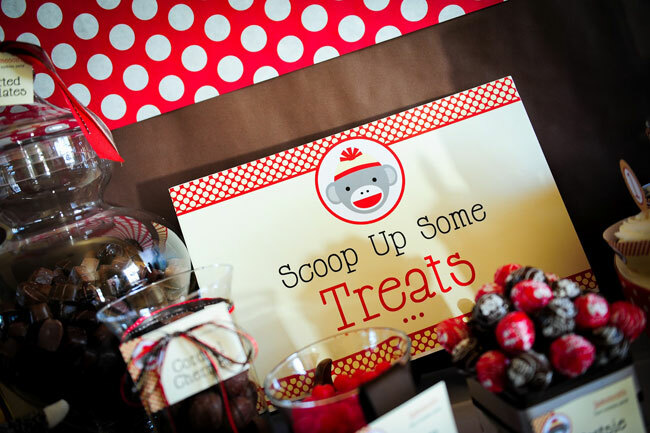 – than this sock monkey theme party planned by Jennifer Laws for her youngest son, Jameson! 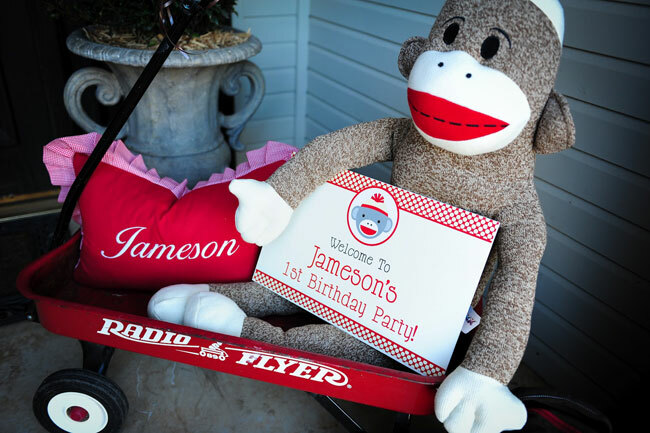 Jennifer says she had picked the sock monkey birthday theme before Jameson was even born – he had come home from the hospital in an embroidered sock monkey onesie and hat. 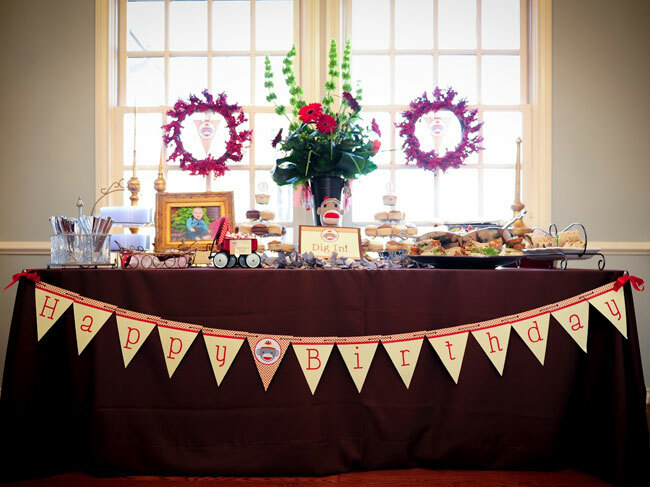 Thanks to loads of planning and a great attention to detail, Jennifer created the most beautiful party full of sweet memories, whimsical displays, and personalized touches. 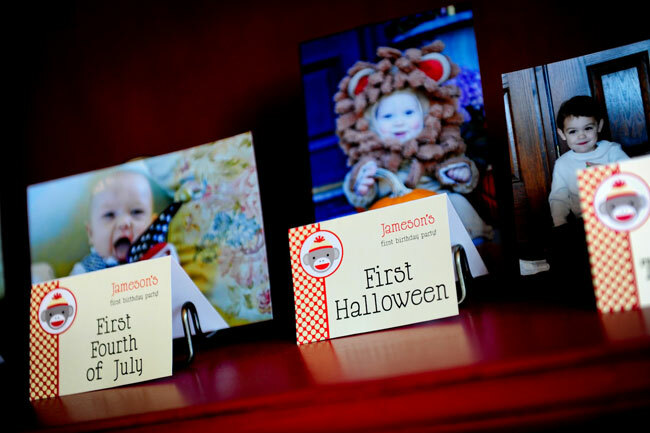 There’s a lot of inspiration here for any first birthday party! 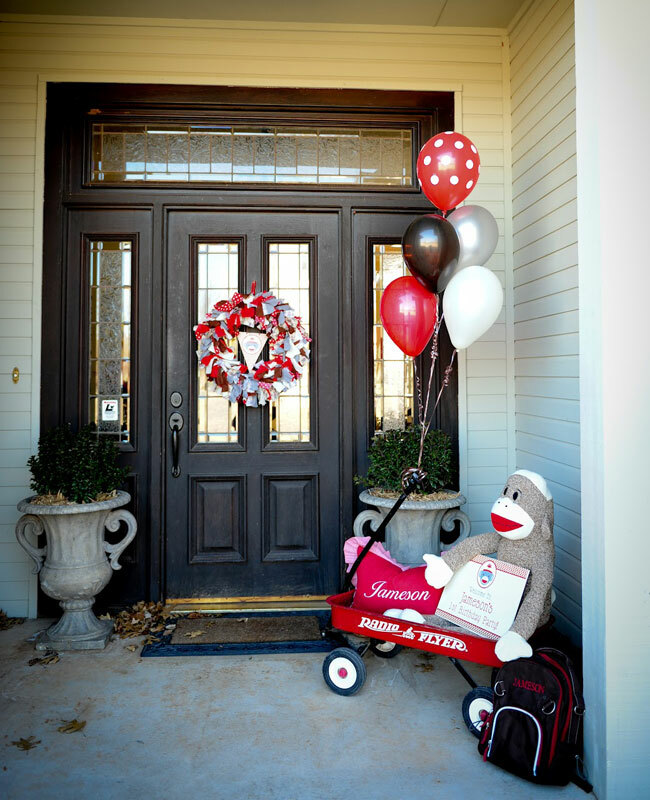 At the front door, a huge sock monkey welcomes guests to the party! 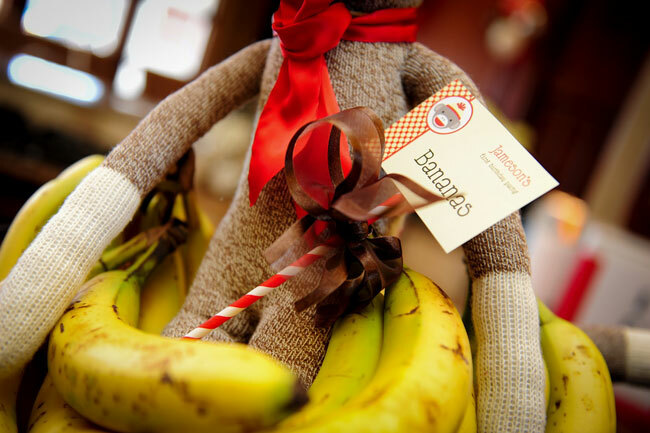 Jennifer found the four-foot sock monkey at Walgreens for just $20! The sign is a custom printable. 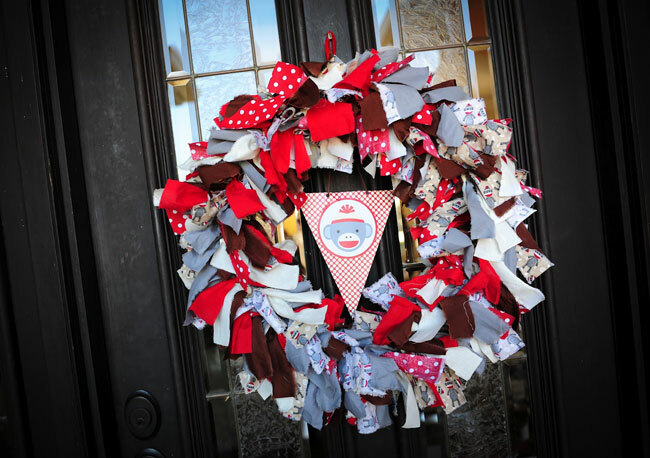 The rag wreath is homemade, and the triangle inside is one of the pieces from Jameson’s printable banner. Jameson’s shirt was made by cutting a #1 from a sock monkey sock purchased from Hobby Lobby, then sewing it to a plain white tee. The sweets table is just precious! 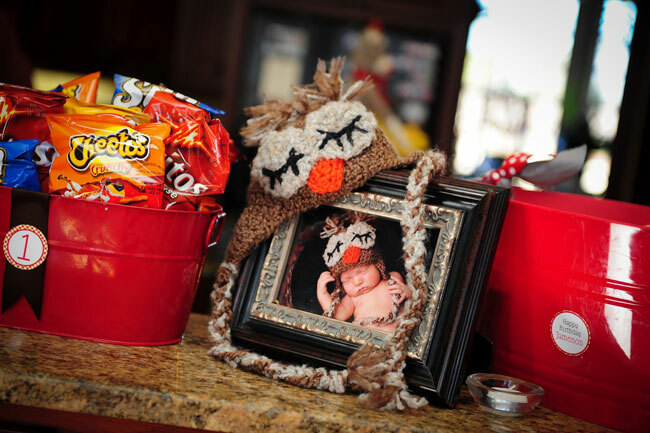 Stuffed sock monkeys are mixed in among the jars of treats, and one of Jameson’s two custom party hats is on display. 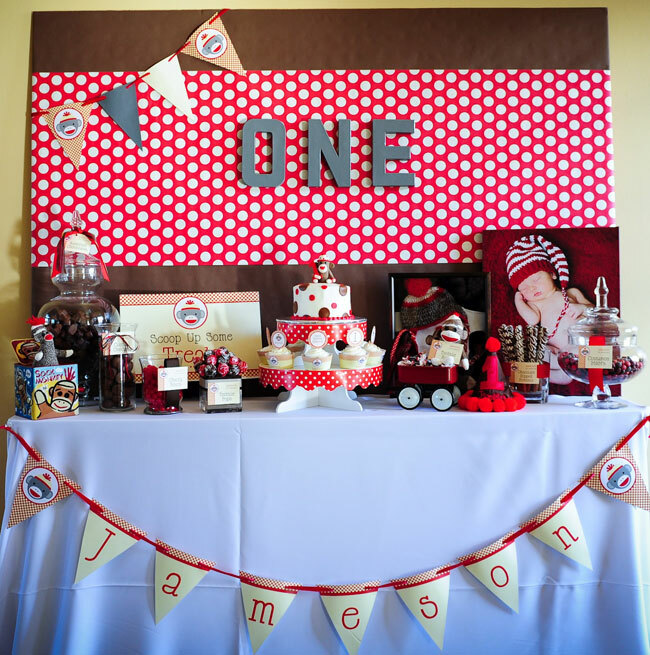 The backdrop is made from red and white polka dot paper and plain brown paper. The “O-N-E” letters are from Hobby Lobby, and have been spray-painted gray to match. My favorite touch are the extra banner pieces in the upper left-hand corner of the backdrop! 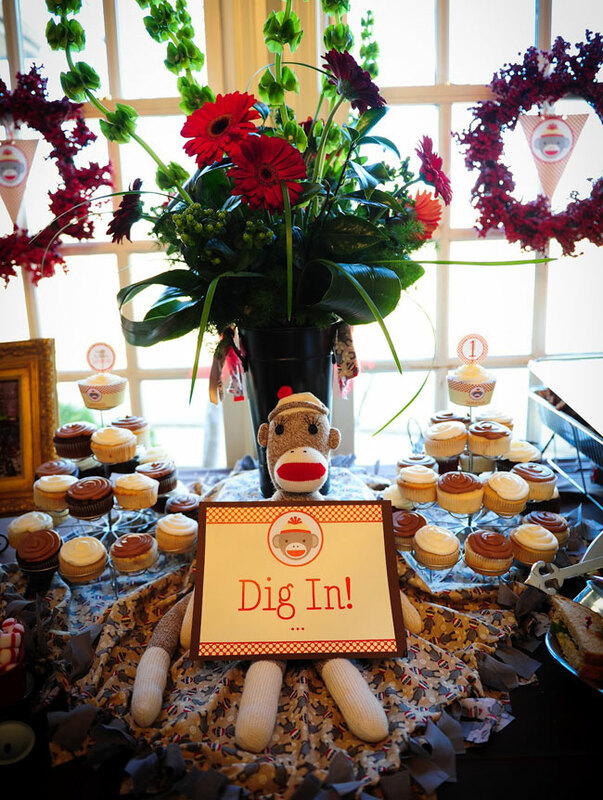 The cupcakes were decorated with printable toppers and wrappers. The adorable cake topper is by Waxela Sananda. Isn’t this the most darling little vignette? 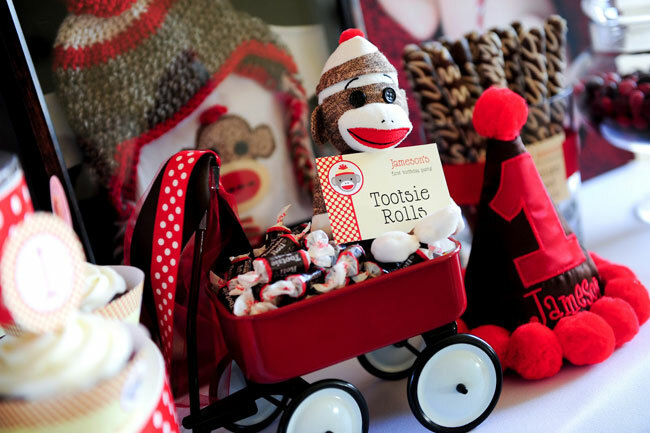 I just love the little sock monkey in the tiny red wagon! 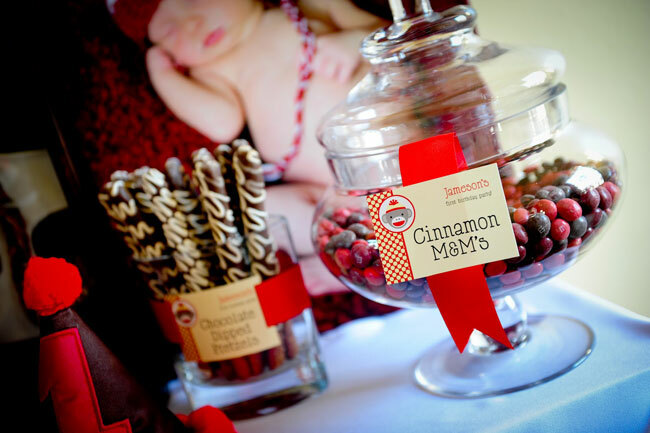 All of the candies were labeled with individually personalized buffet cards, and wide red ribbon was used in all different ways to accent the jars and vases. 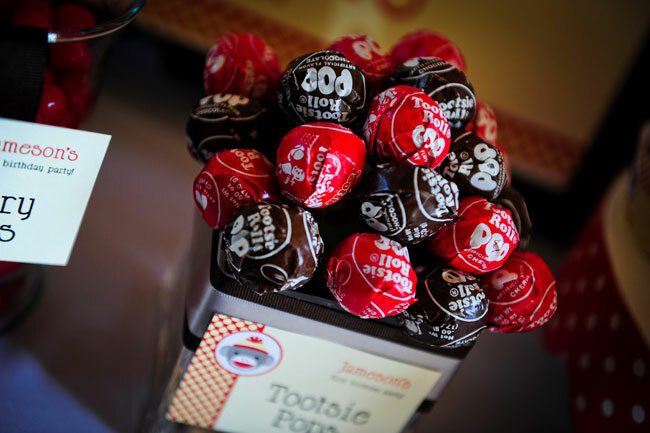 Instead of putting the takeaway bags on the candy table, they’re displayed on a separate table. The tiny sock monkey is from Hobby Lobby, and the photo is of Jameson in his coming-home-from-the-hospital sock monkey outfit. The paper bags are accented with small stickers. 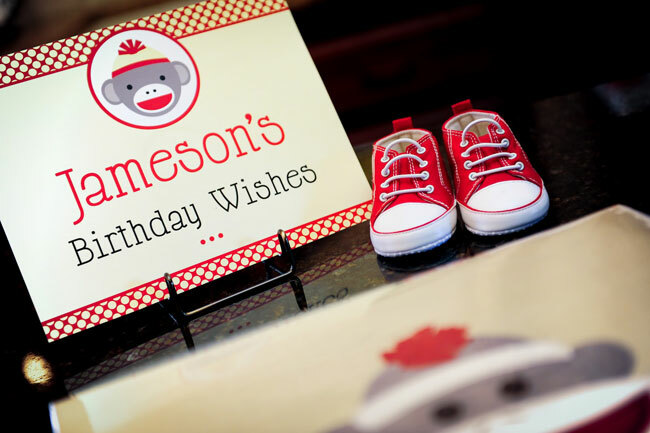 Jameson’s birthday wishes sign is a custom printable. 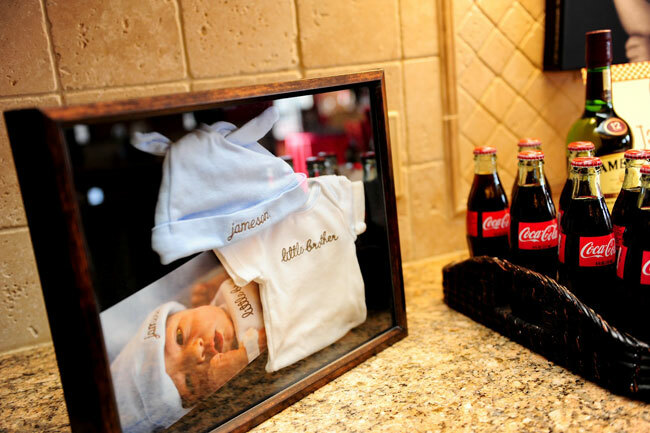 Jennifer displayed the outfit that Jameson wore on the day he met his big brothers at the hospital. I really love this idea! 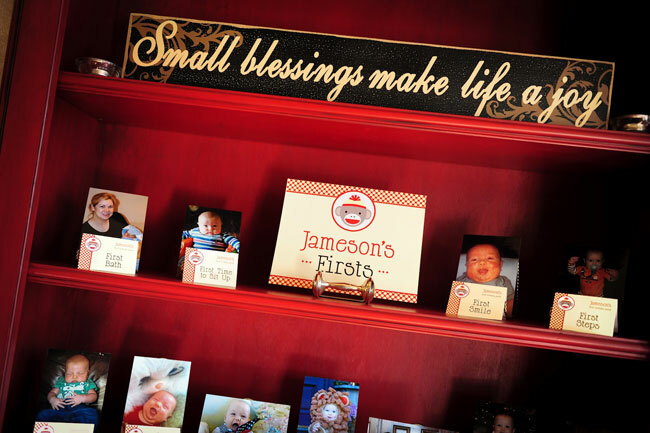 To highlight all of Jameson’s firsts, Jennifer decorated a hutch with photos of all of his milestones. 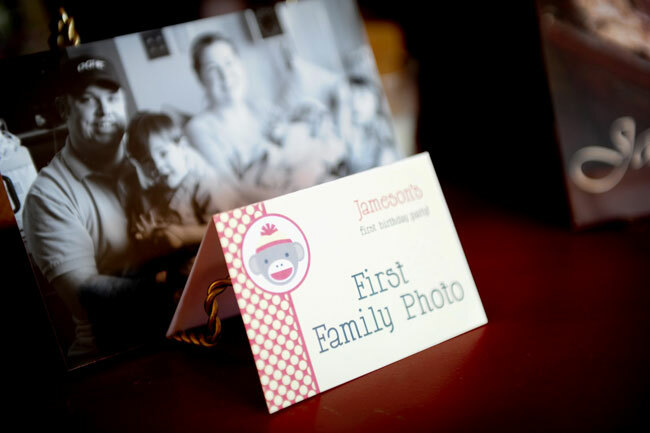 Each photo was labeled with an individually personalized buffet card. Jennifer had read that champagne toasts are appropriate for milestone birthdays, and of course a first birthday is a huge milestone! 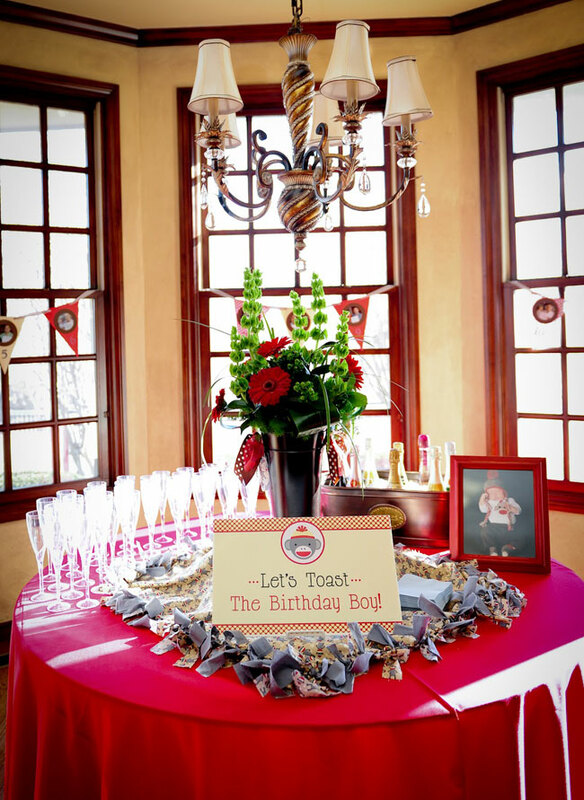 She set up a separate area of the house just for the toast, with a printable sign, a beautiful flower arrangement, and a homemade banner featuring photos from Jameson’s first year. 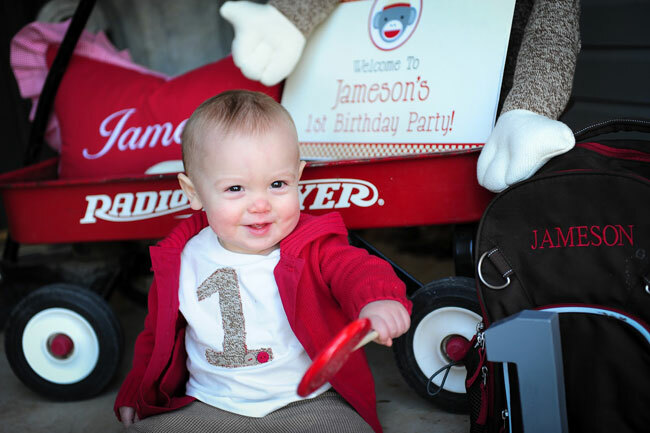 Jameson’s personalized bib is from Dainty Couture. Still another beautiful table held a lunch buffet of wraps, fruit salad, and cupcakes. Time for cake! The guests sang happy birthday, then guitarist Jeff Wood played “Somewhere Over the Rainbow” while Jameson dug into his cake. 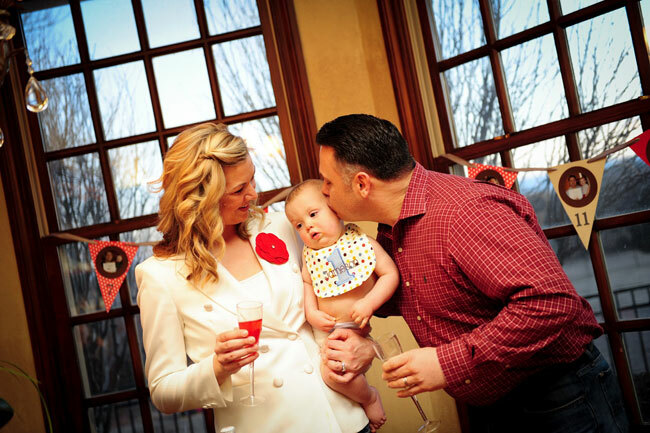 This party was also featured on Kara’s Party Ideas and on Jennifer’s blog, The Laws of My Life. 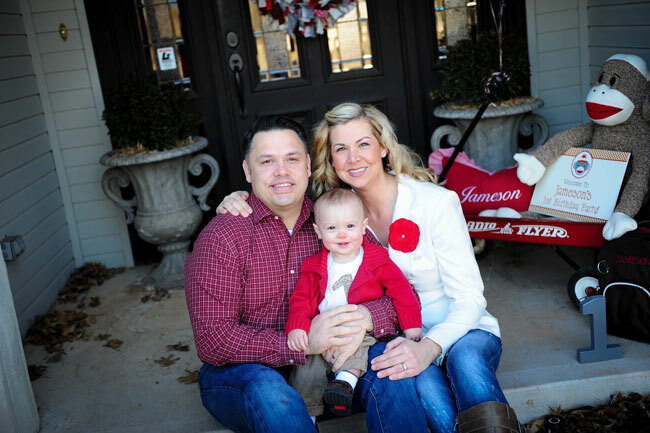 I love the idea of doing the "First" photos... it is a way to highlight those small moments common and obscure. Aw, thank you Heather! This was so sweet of you to post! 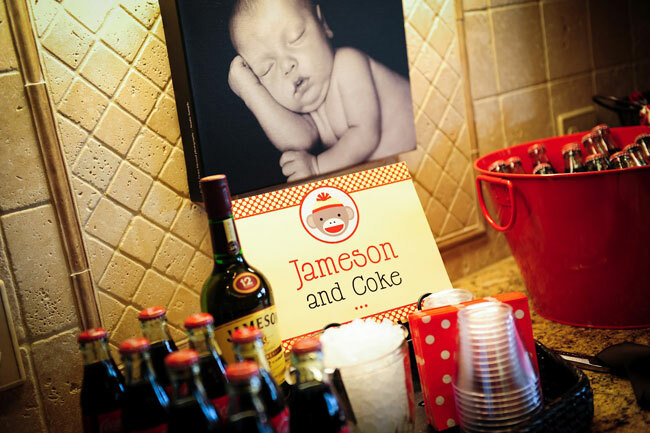 I loved working with you on Jameson's party! It was such a special day for all of us! I hope to work with you again on another party -- all my best to you!!! WOW, what an amazing looking party, so much beautiful little details. Eeek! 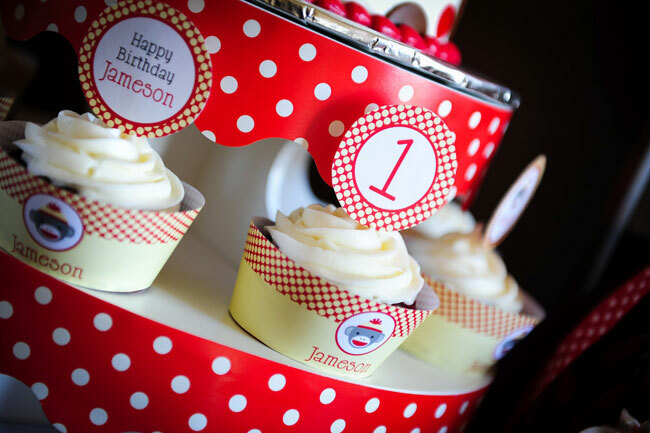 Too cute- stumbled on this while researching ideas for my son's second birthday party. You have given me some fantastic ideas! That's great Julie!! 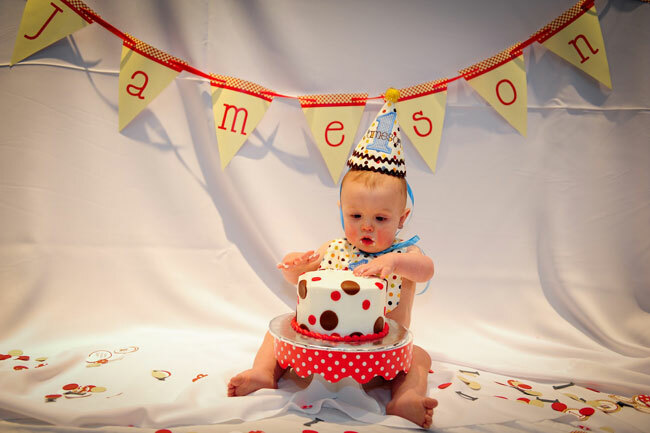 I definitely have some really creative customers, like Jameson's mom - I'm always learning so much from them too! Absolutely adorable!!!! 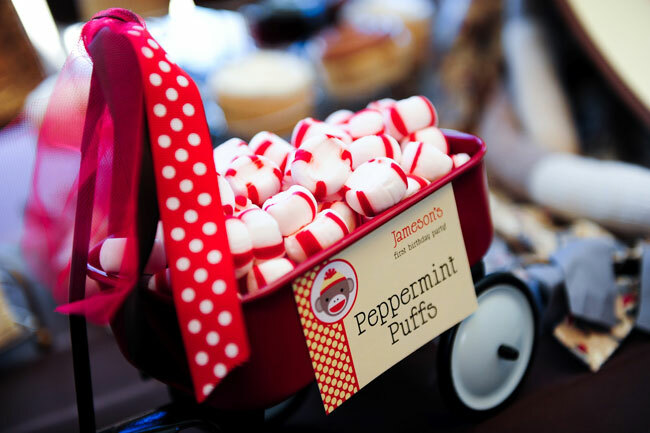 Where in the world did you find those adorable tiny wagons and mokeys?? Thank you so much!! Everything is beautiful!! Wow! What a beautiful home and fabulous CHICKABUG decorations! Jennifer must be an amazing mom to have time to do all that! She definitely is!! She does it all, somehow, and makes it look easy! Such an adorable party!! I would like to know what you attached the papers to as far as the backdrop? Is it cardboard or wood? 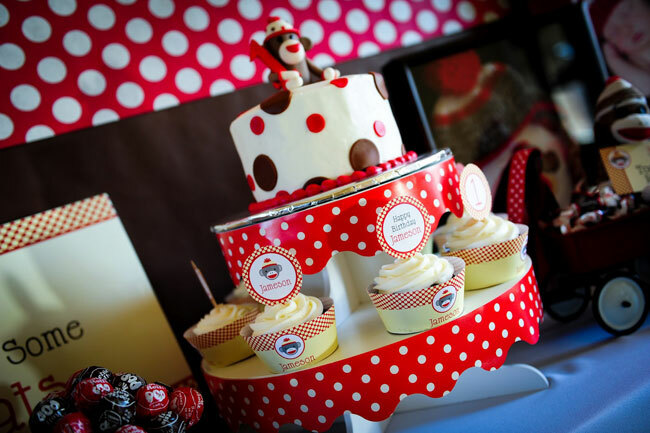 I am wanting to make a backdrop for my son's party about the size you have on the sweet table and have been trying to figure out what to use that is big enough. Thanks!! So Precious! Love the wreath! 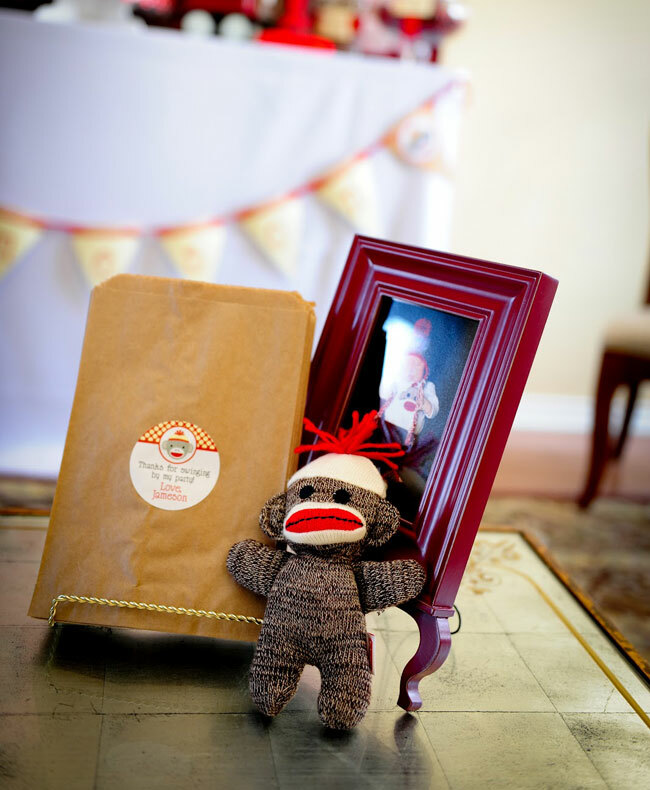 Where did you find the sock monkey fabric?